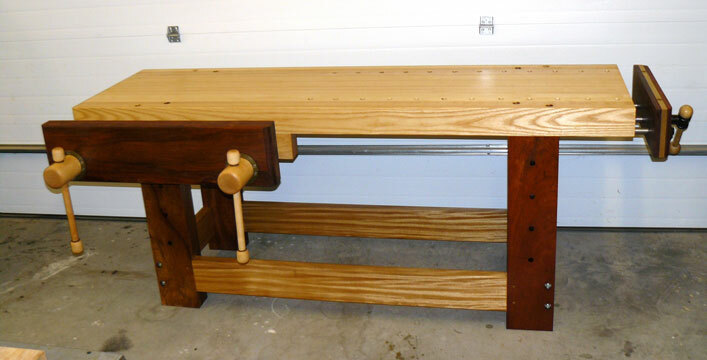 Adding our December 2012 Workbench of the Month from Thomas K. of Edinburg, Virginia to our Lake Erie Toolworks Blog for ease of access and historical awareness. 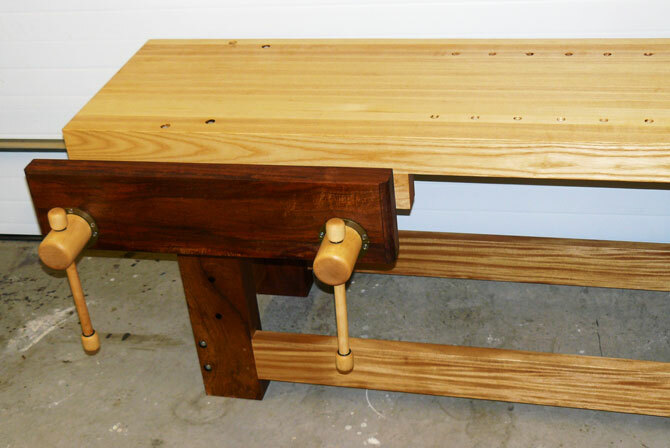 This is a right-handed Holtzapffel workbench modeled after the one in Christopher Schwarz’s book The Workbench Design Book. The bench is 7′ long, 24″ wide and 35″ tall and weighs slightly more than 400 lbs. The top is 4″ thick FAS ash. This bench has massive legs at 3-3/4″ x 7-1/2″ (3″ thickness of andiroba faced with 3/4″ of jatoba for added hardness). The stretchers are made of oziga. The vise chops are made of andiroba. The top is 8/4″ thick American ash ripped to the target tabletop thickness. The top finished off at 4+” thick after glue-up. The top was then processed at a local Mennonite planing mill on their Timesaver industrial drum sander. Sanding passes on both sides were made with medium grit sandpaper and with fine paper for the final 0.001″ passes. Final thickness is exactly 4.000″. The long stretchers are jointed to the legs with 2 1/2″ long tendons. I glued these joints and added two counter-sunk 2″ #8 cabinet screws where the draw-bore pegs would have been used. The short stretchers are jointed to the legs with two 3/8″ x 6″ lag screws at each joint. The top is secured to each leg with two 3/8″ x 7″ lag screws. With metal fasteners, the table weighs slightly more than 400 pounds. The finish is two coats of Watco Danish finishing oil. The oil is about 3 years old and has turned coffee brown, giving the table a slightly darker hue. It browns the andiroba; it yellows the ash and oziga. For vises, I installed a twin screw face vise using two Lake Erie Toolworks maple screw vises with a 36″ wide andiroba chop. Their workmanship is impeccable, and the installation instructions worked like a charm. I may build as many as five benches. I plan use this vise layout on all five. 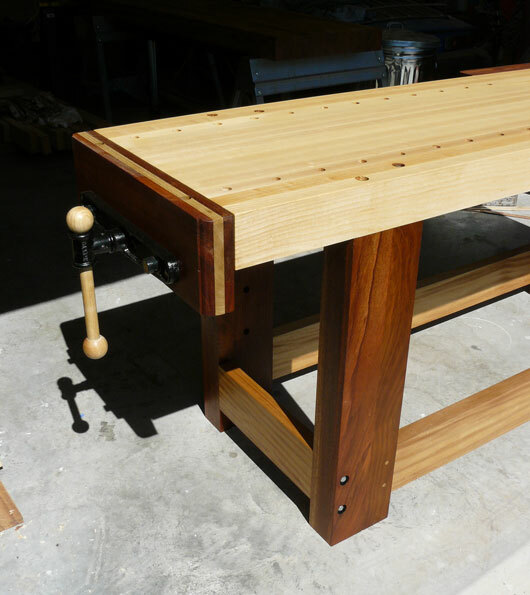 For the tail vise, I installed a Rockler 17″ wide 12″ quick release face vise. This allowed me to use a full table width chop that complements the table top. I think the 24” long tail chop gives the bench a much smoother look and added clamping capability. Based on Chris Schwarz’s comments about “things he would have changed” about his Holtzapffel layout, I bored the first row of 3/4″ round dog holes inset 4 3/8″ from the front edge and spaced them 4″ apart. The 4-3/8″ number was selected to miss table legs and face vise screw blocks. I added a second row spaced to miss the back legs and tail vise hardware. For moving, the top can be unbolted in several minutes. If desired, the short stretchers can be unbolted from the legs, leaving two sets of two legs permanently joined by the long stretchers. In addition, the tail vise and both face vise screws can be partially or fully removed from the top. Even the two Lake Erie screw vise nuts are secured to the top with two 3/8″ x 6″ lag screws. However, even dissembled, the top weighs approximately 190 lbs.